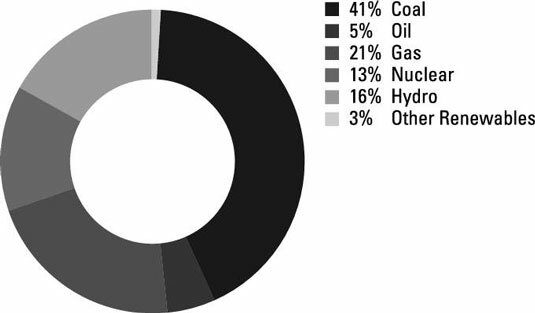 If you are interested in investing in coal, you should know that coal provides 27 percent of global primary energy, and it supplies more than 40 percent of the world’s electricity, as seen in the figure. It became this dominant because coal is so abundant, and it’s relatively cheap to build and operate coal-fired power plants compared to other fuel sources. This makes it an easy choice for emerging markets that are moving up the economic chain and need to produce more electricity for their growing middle classes in a hurry. It takes two to four years to build a coal plant, whereas it takes four to six years to build a natural gas plant. China is dependent on coal because, as of yet, it has not been able to leverage its abundant natural gas fields due to adverse geography. China’s ability to leverage its natural gas reserves may improve in the future and is a risk when considering investing in coal. But at the end of the day, an estimated 1.3 billion people don’t have electricity on this planet, and they want the lights on. China produces the most coal of any country in the world and is also the largest consumer and importer of coal. Going forward, coal demand in China will grow faster than in any other country. Over the next four years, China is building 160 new coal-fired power plants. India, whose population will soon eclipse China’s, is building 46 new plants by 2017. You want to keep an eye on coal investment opportunities as these factors combine to make the most widely used fuel on the planet. The backdrop situation for coal is one in which demand has stabilized or is dropping in the United States and Europe at the same time it’s increasing in China and India. The expectation is that North American coal will supply Asian demand, which may or may not happen, but it will take a few years in any event. Coal exports from the United States run into port capacity bottlenecks. Right now, the United States supplies roughly 10 percent of global coal demand with most of it being consumed domestically. U.S. export terminals have a total capacity of 173 million tonnes per year, or just 16 percent of the nation’s total output. There are efforts to increase West Coast coal terminals, but there are severe political headwinds in Washington State. Don’t look for U.S. exports to fill the global need in the short term. China will drive the sea-born demand for coal over for the foreseeable future. Chinese energy consumption grew more than 12-fold between 1980 and 2009. India’s electricity demand increased by more than 650 percent. By comparison, the United States increased electricity demand by a mere 78 percent over the same two decades. That’s not to say China doesn’t have room to grow. On a per capita basis, China’s electricity demand would have to increase by 500 percent to match the United States. The International Energy Agency expects China to add 75 percent to its current electric base by 2035. Though China leads global demand, India is growing faster in terms of coal imports. This growth stems from the fact that India has a less-abundant supply, and what it does have is restricted by nebulous government and cultural restrictions on land use. Looking forward, much of the global coal demand will be supplied by Indonesia and Australia. Today, the two nations supply 45 percent of the global seaborne trade. Australia, in particular, is pushing hard to expand its ports to meet China’s needs. Indonesia has ramped up its coal exports in recent years due to the inexpensive and low-tech nature of its surface mines, which are located near ports and waterways. The downside for Indonesia is that the country is booming and has an increasing appetite for domestic coal consumption, leading it to use up its reserves. New government policies aim to protect its manufacturing base and keep the energy source at home. Colombia, Russia, South Africa, and Mongolia are also players in the global export coal game. Increased amounts of coal will flow from Mongolia to China because they share a border, and rail-lines are being built. The bottom line is that coal use is slated to rise, and you’d be well-served to take advantage of it by making strategic investments in the sector. 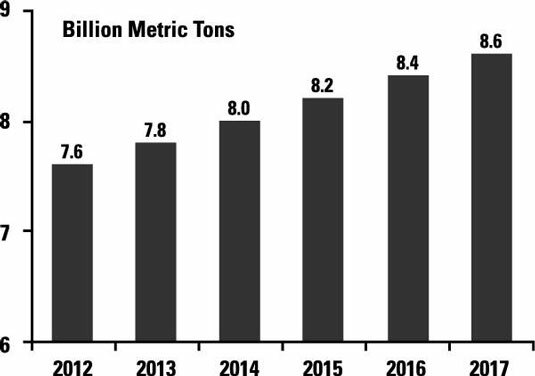 The official forecast from the IEA is for global coal use to reach 8.6 billion tonnes in 2017, more than 13 percent higher than the 7.6 billion tonnes consumed in 2012, as seen in this figure. At that point, coal will rival oil as the most widely used fuel on the planet.